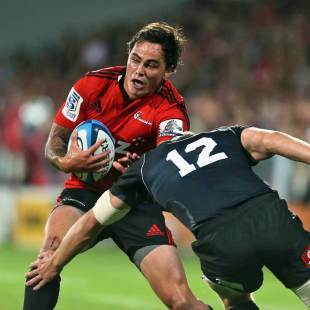 The Crusaders put on an exhibition in the first half to destroy the Southern Kings before coasting to victory at AMI Stadium in Christchurch on Saturday, the southlanders scoring seven tries as they took maximum advantage from the visitors' passive and porous defence. The Crusaders, seven-time champions who showed the first signs of being 2013 title contenders in defeating the Bulls in round five to claim their opening win of the season, continued in the same vein against the Kings but without making the errors that blighted their first 20 minutes the week before. Crusaders captain Kieran Read hailed his team's first-half performance as "outstanding", saying "you've got to come out and really hit it early". Kings coach Schalk Ferreira said "we didn't think it was going to be easy, but ... a few slipped tackles cost us, which isn't like us". The hosts scored at a point a minute for the first 30 minutes, claiming the bonus point for four tries when Willi Heinz touched down shortly after the half-hour mark, the half-back scoring from second-phase play after a move off the top of an attacking lineout in the Kings' 22. The hosts looked dangerous every time they had ball in hand, gifted time and space by the visitors' defensive line that did not step forward, and Zac Guildford, starting on his reappearance after rehabilitation for alcohol issues, moved up from the bench after Israel Dagg withdrew late with a hamstring issue, was involved heavily in the opening try, giving the scoring pass to George Whitelock to touch down for the first of a hat-trick. Wyatt Crockett rumbled over minutes later from close range, the prop scoring his second try in as many games, before Whitelock claimed his second and Heinz secured the bonus point. The Kings were more resolute in the second half, but still they were unable to halt the Crusaders' tide even as the hosts withdrew their big names to preserve them for tougher tasks ahead. The hosts scored a converted try from Matt Todd, the flanker scoring from a rolling maul after an attacking lineout forced after the Kings had been penalised for a second scrum offence, and another from Luke Whitelock, who touched down just two minutes after replacing Todd. George Whitelock completed his treble with five minutes to play, picking and driving over after his brother Adam had been felled short of the line to cap another period of sustained possession. The Kings, whose preparation for the game, their first outside South Africa, was disrupted by news of a South African Rugby Union investigation in the number of overseas players fielded against the Chiefs in round five, at least had the consolation of scoring their first tries in New Zealand. Wimpie van der Walt scored their first try, the flanker touching down after the half-time hooter to cap a rolling maul from a five-metre lineout, and fullback George Whitehead scored at the end of the second half to cap a flowing breakaway from deep inside their own half. Edgar Marutlulle and Devin Oosthuizen, the players called up from South Africa in midweek to replace Argentine Tomas Leonardi and Frenchman Virgile Lacombe, were sent on as replacements for the final 15 minutes.